In case you haven’t looked at my face in six months, I got contacts after wearing glasses for 20 years. I put on my first pair in second grade and besides while sleeping, I always had glasses on my face until a month before my 27th birthday. Nothing else has been part of my life for as long besides my family. Sounds dramatic, but true. For the first few months, I only put them in on the weekends. Gradually, I got better at this whole thing and wore them more and more. I’m at the point now where my glasses rarely leave my apartment, like the facial security blanket that I’ve finally outgrown. I didn’t realize how much glasses were my mask until now. In contacts, I’m the reverse of Clark Kent. Even though I know better, I can’t help feeling as if with this slight adjustment to my face, no one can tell it’s me- nevermind that a high school classmate whom I hadn’t seen in almost 10 years recognized me on the spot this summer. It’s been months and I still feel this way. Which brings me to the hardest part of this adjustment. It’s not touching my eyes, rescuing lens cap lids from going down my sink or even getting overwhelmed by sunglasses (so many choices! ), but feeling like I’m no longer part of this unspoken four-eyed community. 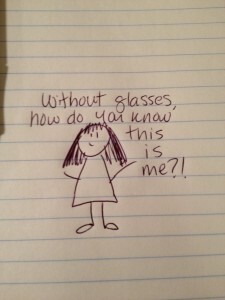 There’s an identity attached to being a daily glasses-wearer, and I don’t have that anymore. Instead, I have questions. Am I more superficial than before? (Probably.) Am I still kind of smart? (Hopefully.) Am I cuter with or without them? (No consensus.) Maybe if I would have made the switch 15, 10 or even five years ago I wouldn’t be in this place, but I’m glad I did it, even if I was resistant for a long time. Don’t ask me about Lasik. One step every 20 years.